My Kid Could Paint That is a terrific film. It examines a multitude of subjects ranging from the nature of modern art to how hard a child should be pushed toward greatness to the relationship between a documentary film and the truth. And all of this breezily realized thanks to the screen presence of a very cute little girl named Marla. Marla Olmstead is a phenomenon. Starting at age three, she’s been creating modern art masterpieces that have drawn not surprising comparisons to the drip paintings of Jackson Pollock. By age five, she was well on her way to a well-padded college fund with her works selling at over five grand a pop. New York got whiff of her. She was everywhere in the art world news. Then 60 Minutes got a hold of the story. That’s the plot. But the film’s fascinations and pleasures fall between the plot points. Placing the kindergarten masterpieces by my daughters side-by-side with works decorating the walls of the Museum of Modern Art, I’ve often asked one of the film’s central questions: Why do some paintings sell for millions while others that appear – at least to my eyes – every bit as beautiful hang taped to dining room walls? Is it really just a matter of a work of art being worth whatever someone can be conned into paying? Is it the whole legend of a tortured soul that arose around Jackson Pollock that made his works priceless or is there really something on those canvases that my kid couldn’t paint? With the Olympics just over the horizon and a film like Spellbound (the one about spelling bees) still a fresh memory, kids with talents being pushed to the edge and beyond by overzealous parents are enjoying a high level of visibility. I’ve even had my own low moments pushing my daughter to higher rungs: “You better not miss a practice to play with friends or you won’t win the 100 butterfly.” Marla’s dad, Mark, is criticized for standing over his daughter, prodding her along, and scolding her for not using enough of the color red. The paintings are more about him – or by him? – than Marla it seems. Bar-Lev’s filmmaking process is left fascinatingly transparent. It is filled with all the little moments – an interview subject’s “off the record” remarks, a scene between Bar-Lev and Marla’s parents that feels like the whole film is on the verge of collapse – which a filmmaker would normally cut to avoid incriminating himself. My Kid Could Paint That plays like an essay on how all documentaries manipulate the truth. We never know who to trust from one moment to the next. When is Marla being her true self – or Mark and Laura, or Bar-Lev – as opposed to some other creature under the influence of a movie camera? Who was more on the money? Jean-Luc Godard (“film is truth, 24 times a second”) or Brian De Palma ("the camera lies all the time”)? My Kid Could Paint That reminded me of the movie Pollock. Pollock was portrayed as a man driven by instinct. When asked about his creative processes, he lashes out in fits of rage, realizing he has no idea how he creates his paintings. Still held by childhood’s embrace but every bit as unaware of her processes, Marla responds with an annoyed “No!” She then dashes off to fight with her brother, to draw doodles while talking a bath, and to get rides on her dad’s shoulders. 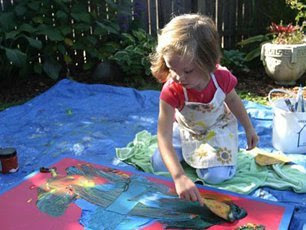 It made me wish she’d stop painting altogether, before she grows up.